Let me warn you right now. I’m reviewing a CD that most of you are never going to listen to, given that this CD is for women and girls only. But that’s okay. We suffered through a whole summer of men’s only events. It’s about time we got some equal time. So, sorry guys, you’re just gonna have to deal with it. And it really is a bummer that you’re missing out on such a terrific album. 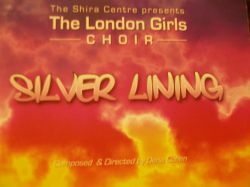 Make no mistake about it, London Girls Choir debut album, Silver Lining is a really solid CD. It’s not a first rate girl’s CD. It is a consistently solid album and trust me when I tell you the boys choirs could learn a few things from this CD. It is just that good. What makes it so good? It’s not the voices, which are fine, though not amazing. It’s the songs which are great and the harmonies which are mind numbingly good. Dena Cohen, the musical director of the Shira Centre does just about everything on this album. She directs, is one of the arrangers, composed all the songs but one, arranged all the vocals, designed the cover along with her husband Arie and plays the keyboards. Oh yeah, she also does some great vocals. Once again, the official disclaimer: This CD is for women and girls only!!!! Having said that, if you guys want to keep reading and see what you’re missing, go right ahead. Avraham Yagel – The fingers snapping at the beginning of this song tell you exactly what you are in for. A cheerful, upbeat song that will have your feet tapping in time to the music. A good opener for this album. Not the best song, but one that is enjoyable enough that you can’t wait to hear what’s coming next. I love the Menucha-a-a-a-ah at 2:59. Silver Lining – The lyrics are not particularly sophisticated but it doesn’t matter. The music is great, the harmonies are top notch and the English accents add so much. Love the silver lining harmony at 2:49. Bicha Batchu – A pretty slow song, nicely done. Love the harmony at 1:42. And this is probably the only girls CD I’ve ever heard where they pronounce their oh’s as oy’s. Kinda cute. Shiru LaHashem – A perfectly acceptable fast song. Love the way they change the words “Halelukah” to “Hallelulu” at 1:00. Little Bird – This lyrics to this song aren’t what you would expect from the title. It’s an older sister singing about her younger sister about to get married. Love the way the song starts out: girls talking excitedly, right before the chupah at a wedding. From there it segues into the Bobover niggun, which is then used as a harmony to the beginning of the song. So unbelievably gorgeous. The beautiful harmonies continue throughout the song and are such a great accompaniment to the moving lyrics. Emor Me’at – Love the low harmonies coming in at about 2:00. I hate to sound repetitive but these are just not your typical harmonies and that’s what makes this album stand out. Love the way they take the words “we should receive” in the harmony and change them to “we should receive we should re, we should receive we should re” (no, that’s not a typo). Yivarechicha – Another pretty slow song, which is where these girls really shine. Like the sound of the baby mobile at the beginning and end of this one. This Sam Glaser composition is the only song on this album not composed by Dena Cohen. Ma Rabu – As much as the slow songs are great on this album, this fast song is far and away the best song on the album. There are so many great moments in this song, starting with the violin intro. Love the little splashes of violin the first and second times through the song. But things really heat up on the third pass through this song. Love the techno piece at 2:24 with, of course, violins in the background. At 3:28 the fun really starts with Dena Cohen’s solo. She hits notes so low and for so long that I honestly have no clue if she was able to get through the whole thing in one shot or if it was patched together in the studio. Love it, love it, love it! Cocoon – The introduction to this song sounds like something out of a science fiction movie, which seems like it should be a little incongruous for a song with lyrics like these. But it works and this soft, soothing song hits the mark. Shabbos Spirit – No words for most of this inspiring song. Eishes Chayil comes in about halfway through, followed by Shalom Aleichem and you almost get that Shabbos in sleepaway camp feeling. Once again, great harmonies. Love the way the na na na’s feed off each other at 3:01 and again at 3:40. One Nation – Okay, this cute song featuring little girls is a little cutesy. But it’s a great concept and it works. Again, the great harmonies at 1:50 and 3:11, which are fairly sophisticated for such young girls, take this song from just cute to a really good listen.